Younger onset dementia complicates it further for children and teens, as rather than a grandparent, it is their own parent, who are still meant to be in the ‘role’ of caring for them. I think for teens, it is probably much easier to live in the denial bubble, and come out from it only when they have to!!! The Alzheimer’s Society of British Columbia has a useful article on their website; Living With Dementia: Children, Teens and Dementia, published in full below. At any age, hearing about an illness like Alzheimer’s disease or another dementia can be scary and confusing. Dementia affects many different types of individuals and families. Hearing about a family member’s diagnosis will be experienced differently by each young person. By understanding how a child or teenager may be feeling, and talking to them about the disease, you can support their adjustment to the changes they are seeing, both now and in the future. Sadness in reaction to what is happening to someone they love. Fear and anxiety about what will happen to them in the future. Irritation or boredom towards the person with dementia (for example, tired of hearing the same stories and questions over and over again), and perhaps guilt for feeling this way. Embarrassment of being seen with the person with dementia. Confusion about “role reversal” (watching someone who in the past was responsible for others now becoming dependent). Loss – because their loved one doesn’t seem to be the same person as before, and they can no longer communicate in the same way they used to. Anger or rejection (for example, other family members may have less time to spend with them). Find a quiet place to talk. Avoid any potential distractions. Assure them that the disease is not contagious. Use simple, everyday words. Avoid medical terminology. Let them know that their feelings are normal. Give them an opportunity to express their emotions. Offer them resources developed specifically for children and teens. View the helpful links on this page. There are also many children’s books available on this subject. Explain that you are available to answer any questions. Give them space. If they don’t want to talk, try again later. The key to supporting children and teens who are close to someone with dementia is to share information with them that is clear and easy to understand. It is also important for them to know that the changes they are seeing in the person with dementia are due to the disease process, and that there is no one to blame. Inform their teacher at school about the situation. They may be able to provide additional support. If possible, try to engage them in providing care and support to the person with dementia. See below for some suggestions. Emphasize that simply being with the person with dementia and showing them love and affection is the most important thing they can do. Part of this process could be to involve them in providing some care and stimulation for the person with dementia. This will help make the situation seem more normal for them, and will ensure they don’t feel shut out. But do not give them too much responsibility or let it take up too much of their time – it’s important that children and teenagers continue with their normal lives. Try to make sure the time they spend with the person is pleasurable. 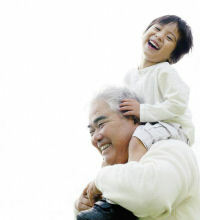 Choose an activity that both the child and the person with dementia will enjoy. Make sure that children know that you appreciate their efforts, and help them see how their involvement benefits the person with dementia. Take photographs of the children and teens with the person with dementia together, to remind them (and you) that there can be good times, even during the illness. Don’t leave children alone and in charge, even briefly, unless you are sure that they are happy about this and will be able to cope. Mum… please don’t forget me? But for many people their form of dementia involves more than just memory problems – for me, horrific fatigue stops me being able to interact with kids much – I’m not able to see them much because I’m housebound to a very large extent. Good info Kate….Very useful for many 🙂 One day soon and now it is not far off, hopefully we will all heal ourselves and disease will be a thing of the past. It is written in our stars. We are almost there! VK xxoo hugs to you…. I will be using these tips in the next few weeks with my boys. I’m finding that when I joke around on comments on Facebook which is what I would normally do they are perceiving this as a “dementia moment” and not seeing the joke they once would have.